After last week’s interview with Michael Pucci, the most bloodthirsty zombie storyteller over at the apocalypse larp/burgeoning media empire Dystopia Rising, I had a couple lingering questions. Pucci kindly played the chainsaw-wielding Bruce Campbell to my evil dead hand of questioning over email. Last week, you talked about how differences in level between new and old players is a challenge for any campaign game. So how are you managing this at DR? As for how to keep the bridge between low levels and high levels as small as we can, our system has avoided perm/blanket damage increase/ damage decrease skills while basing the game design on needing to work with other people to actually do well. Blanket damage increases and decreases are skills that allow for a character to always do an increased amount of damage when attacking or always take a decreased amount of damage when attacked. Many games have skills which allow a player to increase the amount of damage they do on every attack, all of the time, or decrease the amount of damage they take on any attack, all of the time. These blanket damage increases and decreases don’t seem like a big deal when a game is starting out, however, once a game gets a few years into play these skills unbalance game systems. Lets take the idea of a character who is brand new, and a character who is 5 years old in a game design that has these ‘blanket’ skills. The brand new character has no opportunity to have their moment in the sun during a mixed level module due the the fact that the established character is always doing much more damage and unaffected by the antagonists that are dropping new players left and right. This blanket damage modification concept makes it so that the established player don’t have to think about when to use skills or how much they are willing to push themselves due to the fact that their character always does more damage than everyone else around them. By designing skills that have a limited number of activations or a cost to activating damage increases it makes it so that the higher level characters are not always clearing the field while the new players sit on the side and watch. Higher level characters need to consider if they want to exhaust their character sheet to do increased damage for single strikes or short periods of time or if they would be better suited later on. This cost applied to skill usage makes it so that even the lowest level character can catch a high level character when they are tapped out. In addition all major items that can be made or gathered at a game expire… that way you have need to work with traders, crafters, and supply organizers. What is a splatter mod*, and why would I want to go on one? A splatter mod is a module where you could get wet, blood covered, or end up touching/interacting with nasty things. We warn our players with ‘splatter module’ signs before a splatter module because some people love the visceral aspect of climbing through a tunnel filled with bloody body parts or sliding down a thirty-yard Slip ‘N’ Slide covered in fake amniotic fluid. Other players hate the idea of getting messy, so we allow players to decide while being forewarned. As an example, one of our characters was pregnant. She decided she wanted to roleplay the process of giving birth at game, so, we hooked up four pressure shooters with a quart of fake amniotic fluid, one and a half gallons of fake blood, two fake babies, and a knotted pig intestine. Because of an illness plot we ran there were complications during the birthing and the doctor characters had to untie the intestines (in the bag, unable to be seen, covered in fluid) within a certain time. Each time they moved the bag it caused the character to hemmorhage and shoot blood on the doctor and the surrounding crowd. *”Mod” is short for “module” and is the basic unit of adventure — it can mean anything from a small encounter between an NPC (non-player character) and a PC (player-character), to a puzzle set up for several players, to a large scale battle with tons of NPCs. Bent on ruling the world with an apocalyptic cult following as a young man, Michael Pucci found himself distracted and had his focus shifted from the glamorous profession of world conquest to the world of gaming. Willing to try damn near any table top game or larp, as a Storyteller Michael found himself more and more frustrated with systems that focus so much on mechanics that they actually take away from the experience of the players. After wandering the wastelands of gaming basements for almost two decades looking for the holy grail of gaming systems, he decided that if there was to be change… it must come from within. 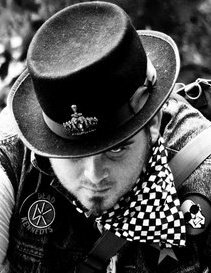 Sitting down with a crack team of zombie-cyborg-ninjas, Michael created the Dystopia Rising setting and began writing both larp and table top rule books. Photos courtesy of Dystopia Rising. This entry was posted in Blog, Larp and tagged Bruce Campbell, Dystopia Rising, Larp, Michael Pucci, zombies by Lizzie Stark. Bookmark the permalink.